Description: Protocol for heat shocking ants from acclimatized Phytotron colonies for gene expression analysis. Note that prep time takes about 10 minutes per colony for me. Warm water bath to 37C. Check that there is liquid nitrogen and freezer boxes properly labeled. Count all workers in nest box and transfer to sorting container. Record larvae if any. Record weight of all ants excluding queen. 8 ants to each glass tube (16 total). Put cotton ball in top of the HS tube to keep ants out of cap. 5 ants in each eppendorf 2-3 (10 total) for PS. 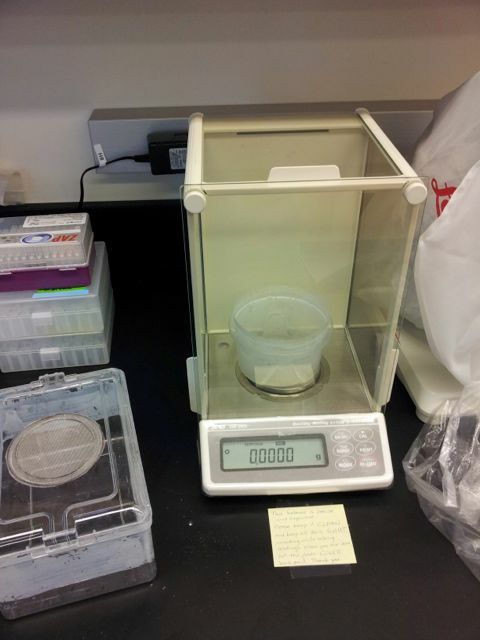 If there are not enough ants, allocate first equally to the heat shock and control glass tubes (e.g. 4 ants in each glass tube). Place the CHC tubes directly into -80 freezer. 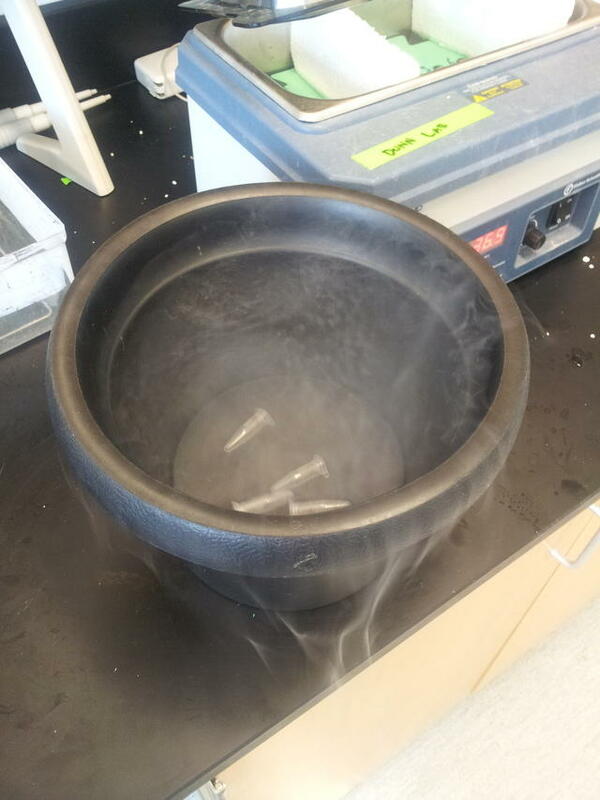 Drop the PS in liquid nitrogen and then transfer to -80. Place the HS glass tubes in floating holder in water bath one at a time separated by one minute to allow for processing time at end. Control tubes stay on the lab bench at ambient temp. Start timer to 60 minutes with first tube. 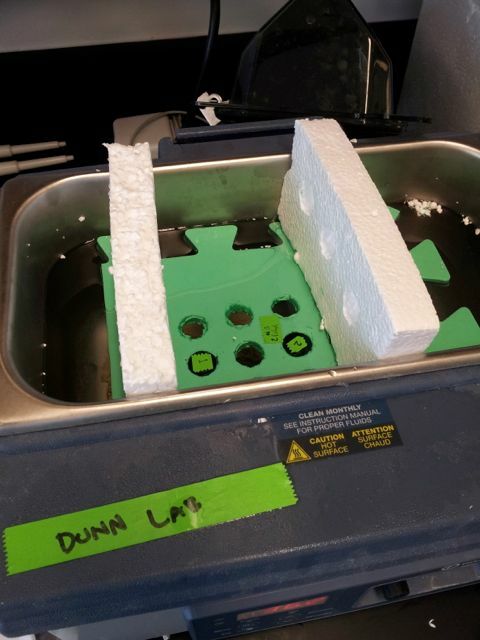 When all tubes are in, use foam blocks to keep tubes fully submerged as shown in picture. 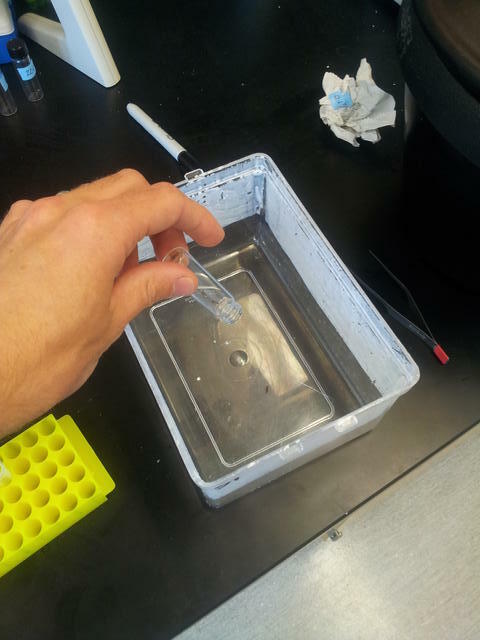 Note that tape often comes off tubes in the water, so keep track of the # of the location of each tube. While waiting, label 4 eppendorf tubes for each sample and pour some liquid nitrogen into ice bucket. 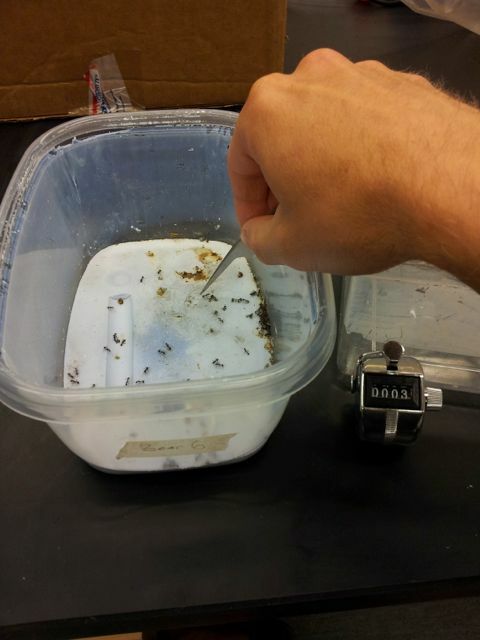 After 60 minutes heat shock, knock ants from glass tube into sorting bin (wipe tube to keep water out of bin). 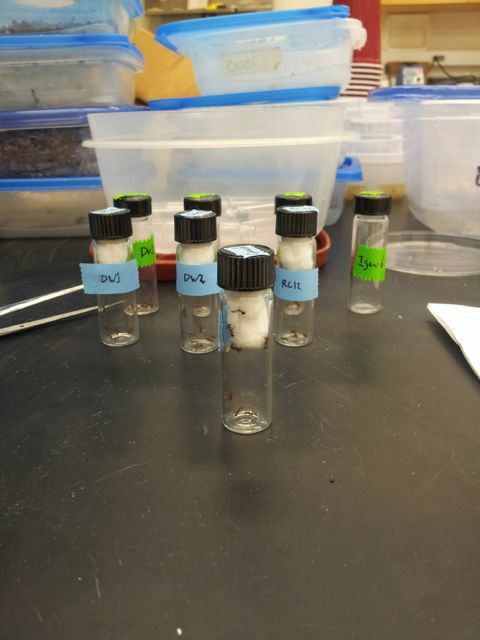 Transfer 3 ants to each of 2 eppendorfs, and 1 ant to each of the remaining two eppendorfs. Drop immediately into liquid nitrogen. Transfer tubes quickly to freezer boxes in -80.